Abstract: There are many sophisticated methods available for generating patterned surfaces typically only for planar substrates. 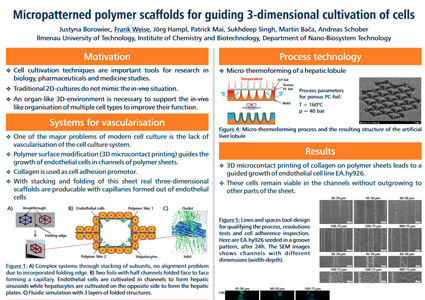 More biomimetic environment for cell culture than 2D surfaces are patterned 3-dimensional scaffolds with native tissue morphology. However, the ability to structure microporous material to predetermined geometries, especially on curved surfaces as well as to guide cell adhesion to non-planar surface still remains a technical challenge. To reach this goal a microthermoforming process is used for structuring . This process is highly efficient and works for most thermoplastics polymers, including permeable polycarbonate membranes as well as biodegradable materials like microporous polylactic acid. Additionally, spatially control of cellular micro-organization was achieved by local modification of the surface of polymer foils during the microthermoforming process. For this purpose we used an elastomeric PDMS stamp. The silicone tools acted as a combined micro patterning and thermoforming tool. Using this process biomolecules suitable for the applied cell type were transfer on the surface of microstructured polymers. EA.hy926 and L929 cell lines cultivated on thermoformed surfaces showed guided adhesion and growth. Cell attachment and spreading were predominantly limited to the microthermoformed structures, in which 3D cell organization was observed.